Sometimes when you meet people it takes a little while to see the potential in them, while others it’s immediately evident. Marvin is one of the latter but I’m not sure most of his teachers would agree. I met him when he was in 8th grade and I bet him a nerf gun that he couldn’t go an entire week without getting in trouble for talking. He won that bet… but it is probably the only time before or since that he has not been in trouble for talking. Now in 11th grade, this hasn’t changed. He is always going to talk (he is very much like a high school Shannon.) But what has changed is his heart. Marvin gave his life to Christ this month after many months of truly thinking things through. This isn’t blind faith or teenage emotions but a well thought out desire to follow Him. We began to see Gods work in him months ago (although it began before this I am sure) when he received demerits at school and “had to spend 50 hours” with Shannon and I serving in our ministry. He didn’t gripe (to our faces) but jumped right in translating, playing with kids and doing anything we asked. I asked him the first week he was with us if he had a relationship with Christ. “That’s a good question, Ms. I don’t think I do but I need to think about whether I am ready for that.” He has spent the months since then serving a God that he didn’t know but in the process learning who He is. I am thrilled to be able to call this young man, my brother in Christ. Just like Paul, when Marvin became a Christian, God began a work in him that others are seeing. One teacher remarked that the change in him is as drastic as “day is to night.” How amazing is our God. I am positive that God has great things in store for Marvin and will use his charismatic and talkative personality to His glory. Our Stories of God working don’t just stop with Marvin. Another young man also came to know the Lord the same week as he was translating for a mission team. Saul is an 11th grader at Abundant Life Christian School and an upstanding young man. His teachers and classmates alike respect him. He has a quiet smile and gentle personality that allows people to see the best in him immediately. When Tyler was in 7th grade he wanted to play basketball. Our students play on a team of 7-12th grade which made this momma a little nervous. But Saul was on the same team and anytime I asked him to keep an eye on Tyler, he readily agreed. He is that kind of kid. He is also a great goalie and will sacrifice his body to stop the ball! However, he could best be described as a thinker. Since Shannon is high on faith and not naturally a person to analyze things, there have been many days this year that he has come out of bible class and said that Saul’s questions were driving him crazy. I love the questions though! From these seemingly endless questions about every single detail that Shannon brings up has come a faith not based on what someone else believes but on what Saul knows to be true. He has sought and found. While Saul has always been a good kid, being a Christian is about so much more! I truly hope that he does not stop asking questions but that as he asks those questions that he grows deeper in his faith and relationship with Christ. 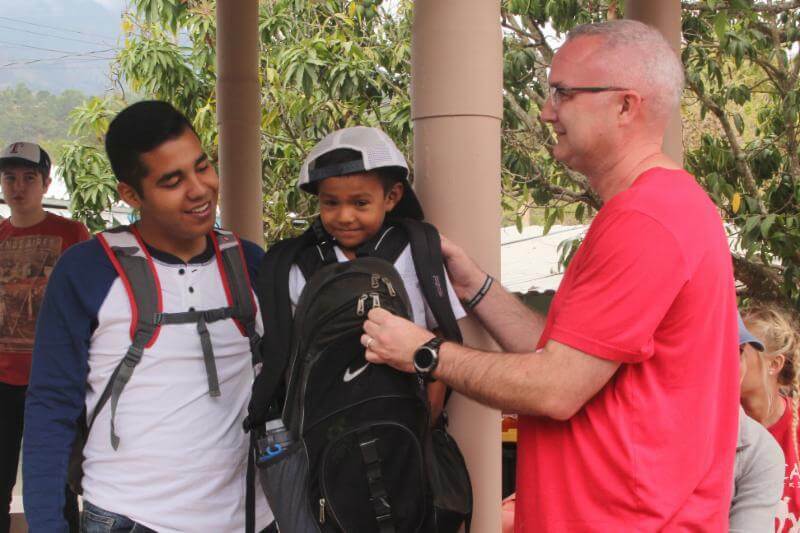 As you continue to pray for the leaders and our students in Honduras at 9:38, praise him that we have two new brothers in Christ!